Joro more shoes and more wins for your this year. Please keep me anonymous. 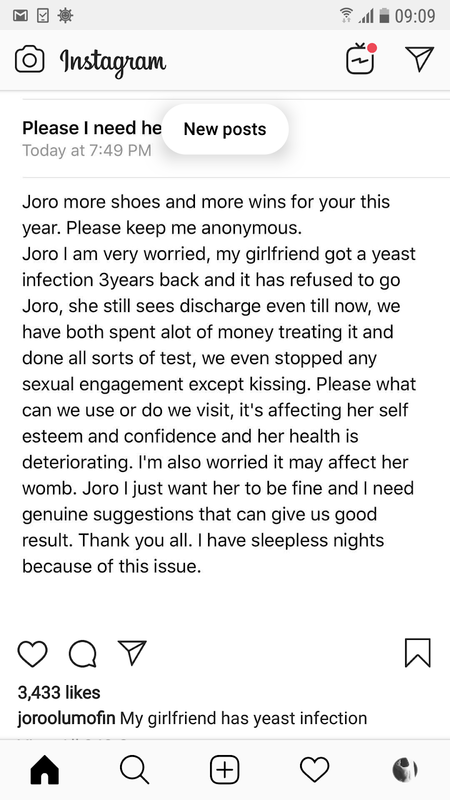 Joro I am very worried, my girlfriend got a yeast infection 3years back and it has refused to go. Joro, she still sees discharge even till now, we have both spent alot of money treating it and done all sorts of test, we even stopped any sexual engagement except kissing. Please what can we use or do we visit, it's affecting her self esteem and confidence and her health is deteriorating. I'm also worried it may affect her womb. Joro I just want her to be fine and I need genuine suggestions that can give us good result. Thank you all. I have sleepless nights because of this issue.